Asia is a continent of superlatives. Nearly every attraction we have visited is touted as the top of its kind and worthy of its own chapter in the Guinness Book of World Records. I’m not sure how many “biggest buddha in country X/Asia/the world/the universe” we have seen at this point, but suffice to say that number is way higher than the logical value of 1. Given how much confusion there is over qualities that theoretically should be objective like size or age, it’s little wonder that things get even dicier when we talk about subjective judgments such as “best” or, since I’m talking about Malaysia and its food in this post, “tastiest”. 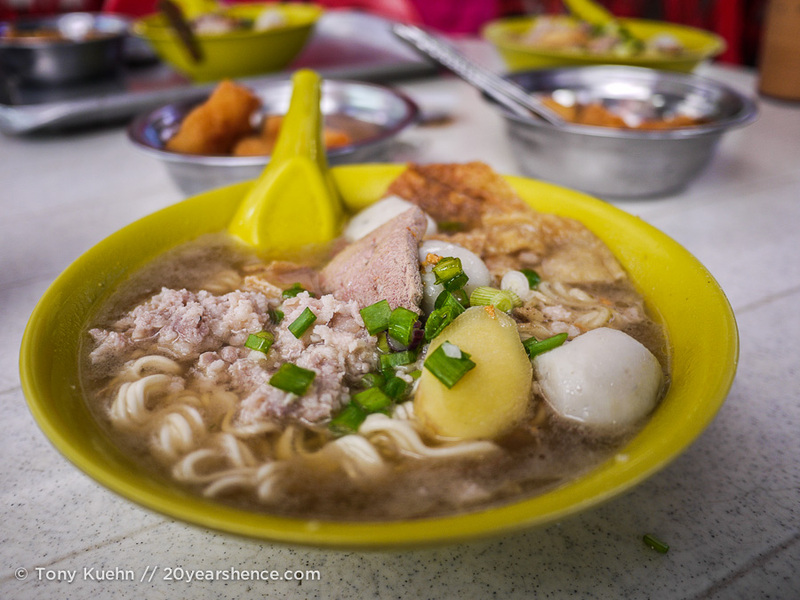 From day one, one of the things we loved most about Malaysia was its food. 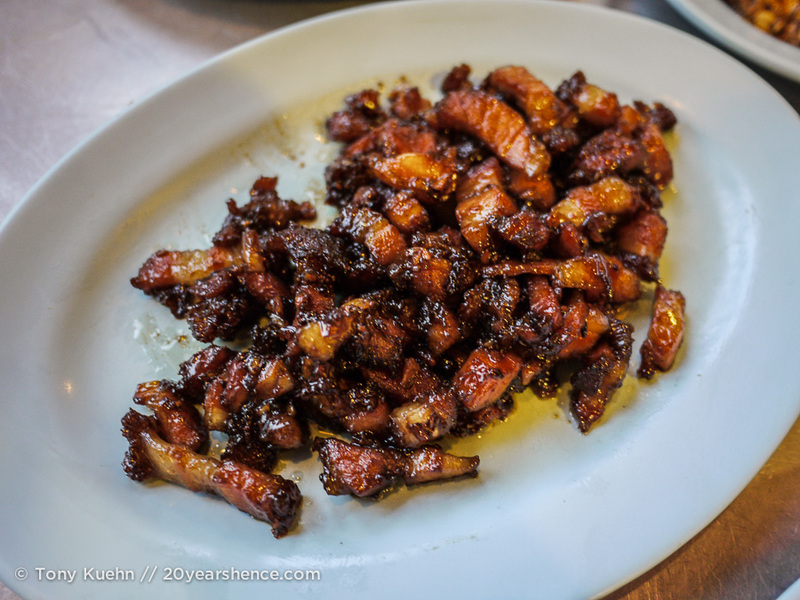 So, it was with a mixture of excitement and skepticism that we processed reports claiming that Penang was Malaysia’s culinary crown jewel—after the incredibly good eating we experienced even in random little places like Muar, it hardly seemed possible that any one place could stand out amongst a landscape of such fantastic food. 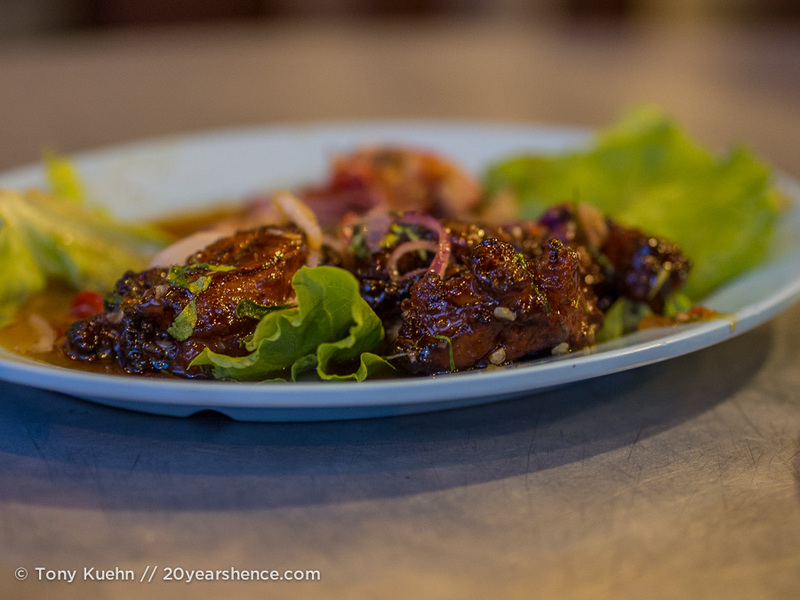 As is so often the way with things that are hyped to the heavens, it’s probably not unsurprising that when we finally made it to Penang, we wound up feeling a little bit ambivalent about the food. Did we eat incredibly well? YES! But was it the BEST food that we had in Malaysia? I’d still say that Melaka earned that title, if just by a hair (though, thankfully, not literally). Maybe it’s because by the time we reached Penang, we had already been traveling in Malaysia for over a month, so much of the food that we encountered in George Town was quite familiar at that point. I wouldn’t say that we were bored of the food—the diversity of flavors and dishes is far too broad to ever fully tire of the food in Malaysia, I think—but, nevertheless, the food in Penang didn’t seem all that different from (and dare I say, any more special than) what we had been eating everywhere else in the country. I can’t think of a single bad meal we had in George Town, but then again, that’s also true for mainland Malaysia as a whole. Lest you think I’m being too lukewarm in my praise of George Town’s much loved food scene, I will say that after several months of traveling through a few other countries, we did come back through Malaysia in order to catch a flight and spent a few days en route back in George Town. All of my notes from that time are entirely about the food we ate, and this is largely because we didn’t feel the need to do anything else, we were so content simply ambling the streets and tucking into amazing plates of richly flavorful food. So I’m not dissing Penang’s food. Promise. 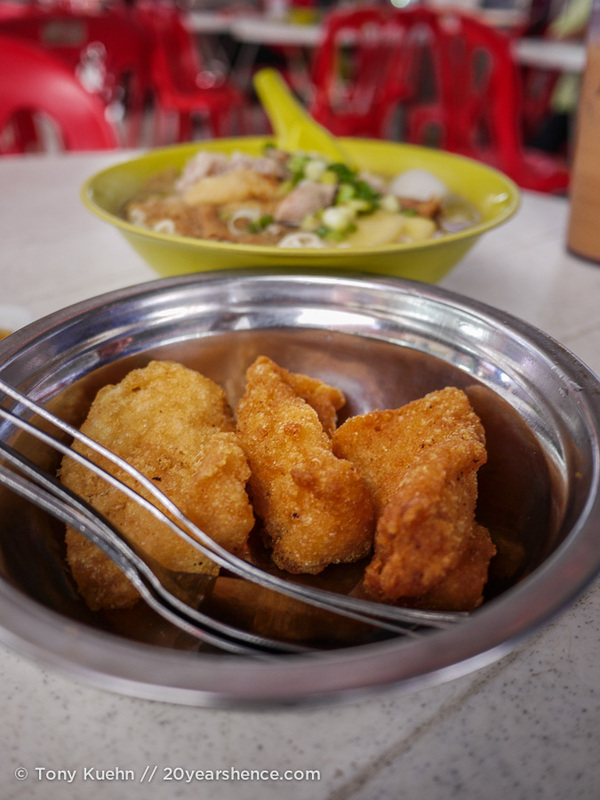 The only thing I would maintain is that I do think it’s erroneous to name George Town as one of Asia’s top street food destinations—we spent A LOT of time wandering around looking for food and very rarely did we see actual street food. Rather, the approach to food here seemed to be much as it is in Singapore where there are hawker centers (some of them even open air), but not really much curbside dining. No discussion of our gluttonous ways in George Town would be complete without a mention of the incredible Indian food we sampled while there. The smells emanating from the various shops and restaurants on Lebuh Chulia, Lebuh Queen and Jalan Pasar, the core of the city’s lively Little India district, were out of this world. 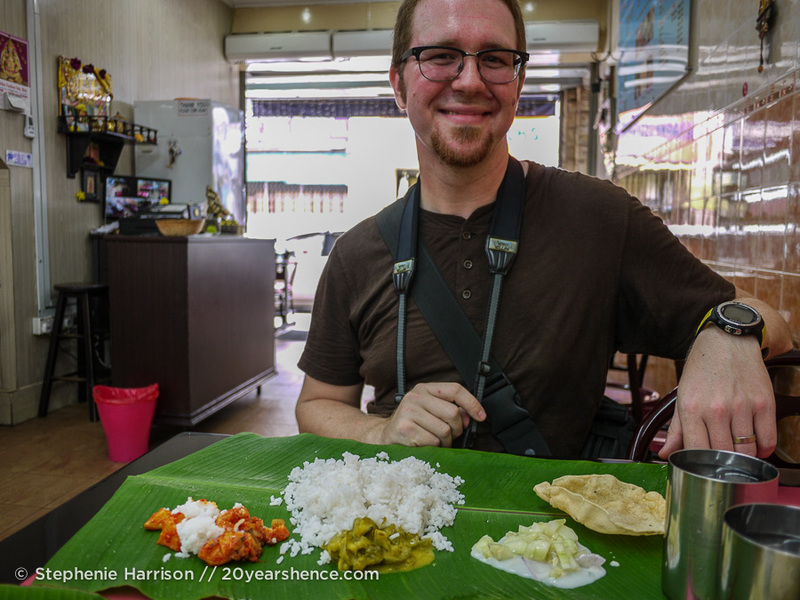 Succumbing to temptation, we ate at a bona fide banana leaf southern Indian restaurant where we indulged in the lunchtime veggie thali set that was ladled onto our “plates” from little metal pails. It was essentially like a sit-down buffet as the folks at the restaurant were happy to continue dolloping curries and rice onto our leaf for as long as we were happy to keep eating. 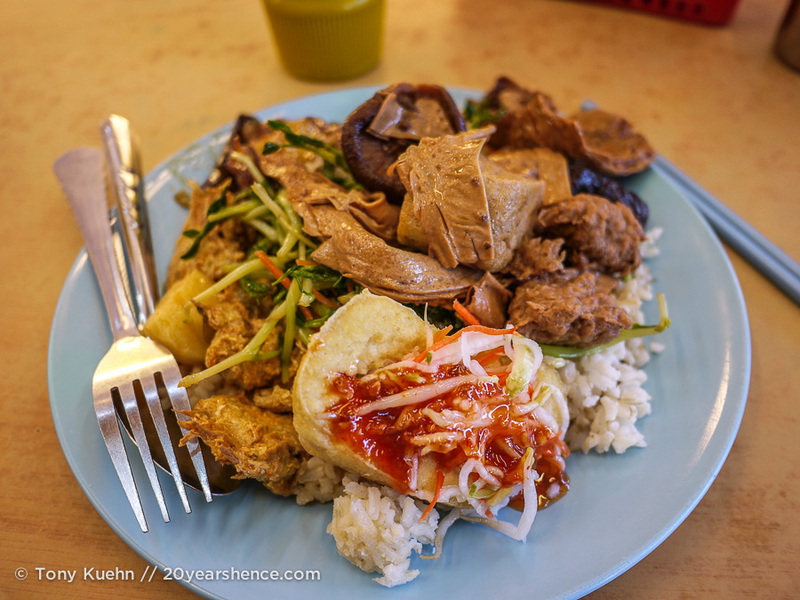 At around 8 MYR (~$2.40US) per plate, it doesn’t get much better or cheaper than this! 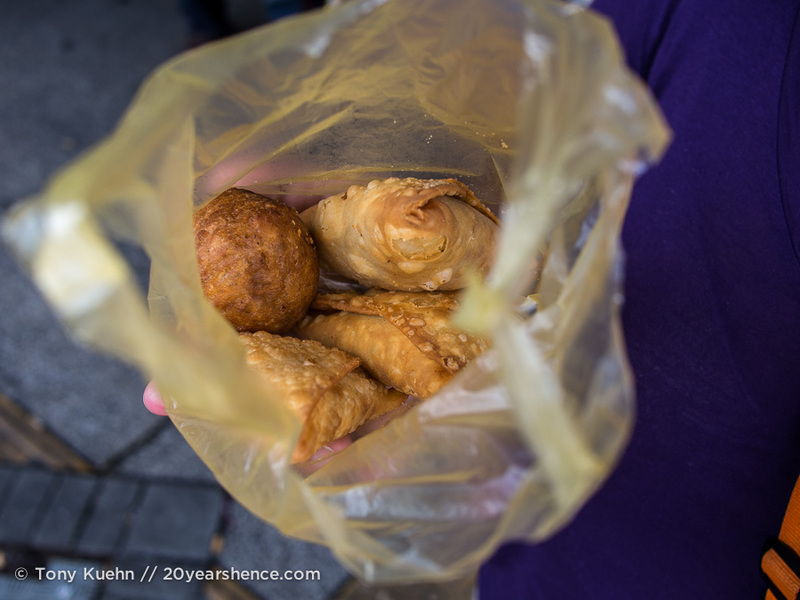 While walking by the Kapitan Keling mosque we also had one of our few tastes of genuine street food in George Town. We stumbled upon a little establishment that served up a local specialty, nasi kandur, which is essentially rice with a selection of curries. We sat down at a little table set up right on the sidewalk and dug into some curried cabbage and a chunk of unctuous goat on a bed of fluffy rice. Although tasty and packed full of flavor, we felt the portion was a bit small, especially given the price of 9MYR ($2.7US)—it certainly didn’t break the bank, but the amount of food was far smaller than what we enjoyed at the banana leaf restaurant and for more money, so it didn’t feel like an especially good deal. 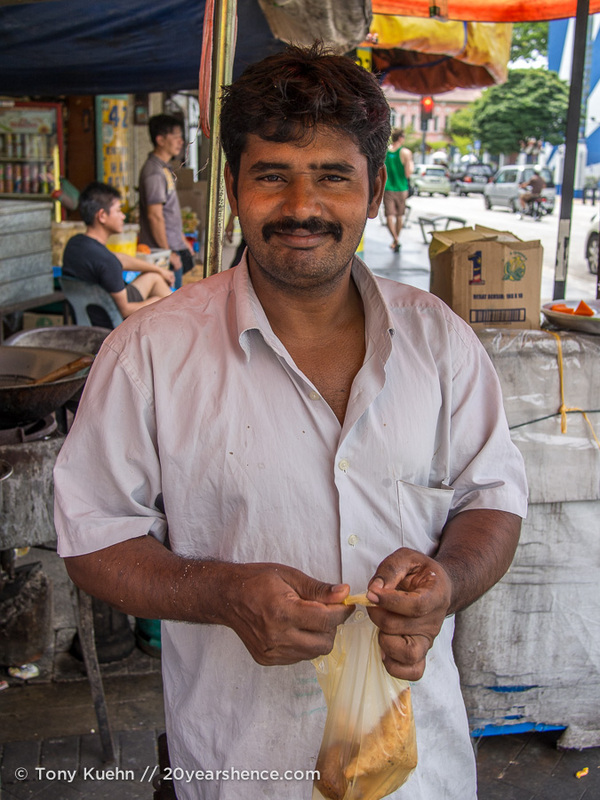 Not so for the amazing little samosa cart on Jalan Penang (another example of street food!) we encountered during our rambles run by a lovely man from India. Serving up piping hot pastries stuffed with curried potato or chicken, we enjoyed 4 of these delicious snacks for just $1US! It may have taken us a second visit to the city to discover Jaya, but better late than never. Open 24 hours, this restaurant serves up incredible Indian food at any time of day. 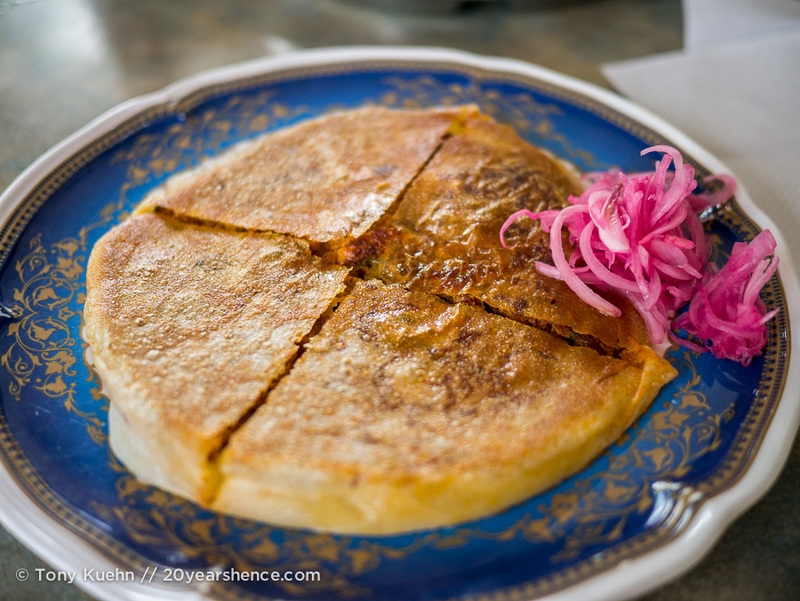 We tried the mutton murtabak and—at the owner’s urging—the chicken roll, which was essentially a delicious wrap sandwich using roti for the bread and stuffed with succulent hunks of tandoori chicken. Every dish here was fresh and packed with flavor, and we both regretted having missed out on it during our first visit. If you’re heading to George Town, don’t make the same mistake that we did! 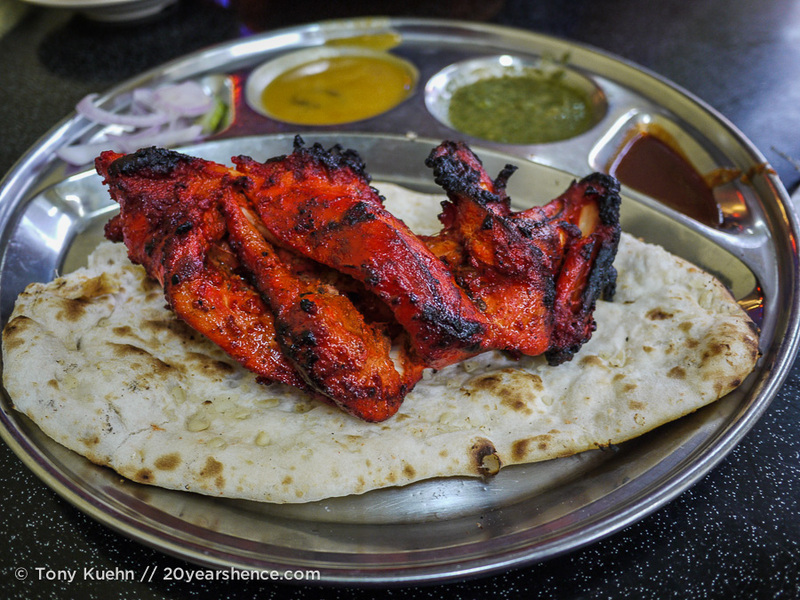 The tandoori chicken set, which featured a massive nan bread and chicken that was ridiculously juicy… And if you’re feeling especially flush, plump for the Kashmiri tandoori set, as they’ll stuff the nan full of dried fruits. Butter chicken, perfectly rich and creamy. Utterly decadent! We ate this alongside biryani, a dish I often find a bit aggressively spiced, but here the spices were wonderfully balanced and also rather unusual as there were striking anise notes to the dish. Chicken 65, crunchy nuggets of spiced chicken that are perfectly crispy and will have you eschewing McNuggets for the rest of your days! 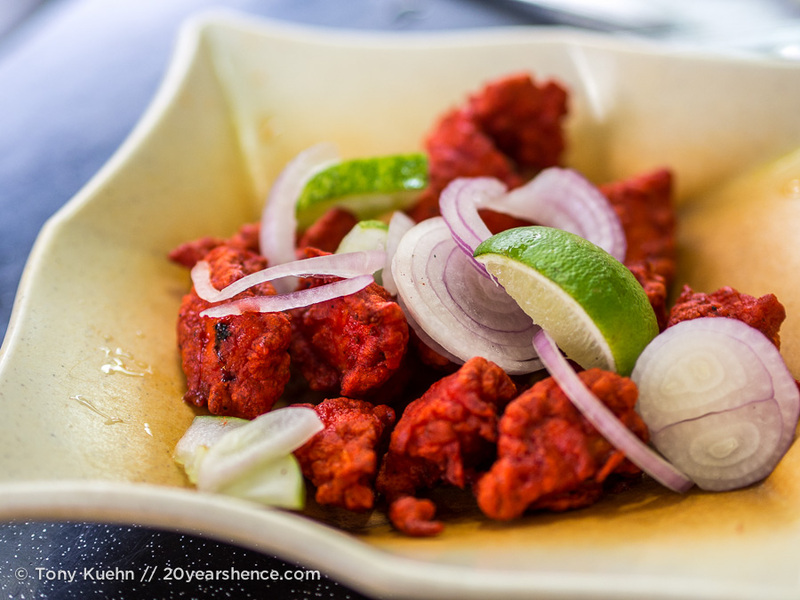 Kapitan’s is something of an institution in George Town and one of the most famous Indian joints in the city. Having had the food several times, it wasn’t hard for us to understand its popularity! With a sizeable Chinese population, it’s little wonder the Chinese food in George Town is pretty fantastic. 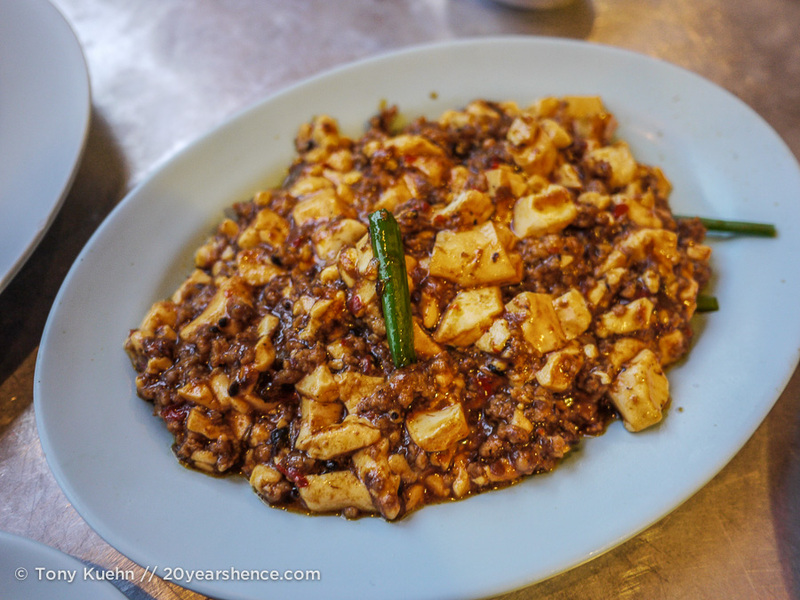 Although the historic core of George Town is fairly compact and easily walkable, we found that most of our favorite Chinese meals were a little farther out and required a motorbike to reach. Trust me when I say they were well worth the extra effort! First up, a place that pretty tells you what’s what just from its name: Yummy Cottage! 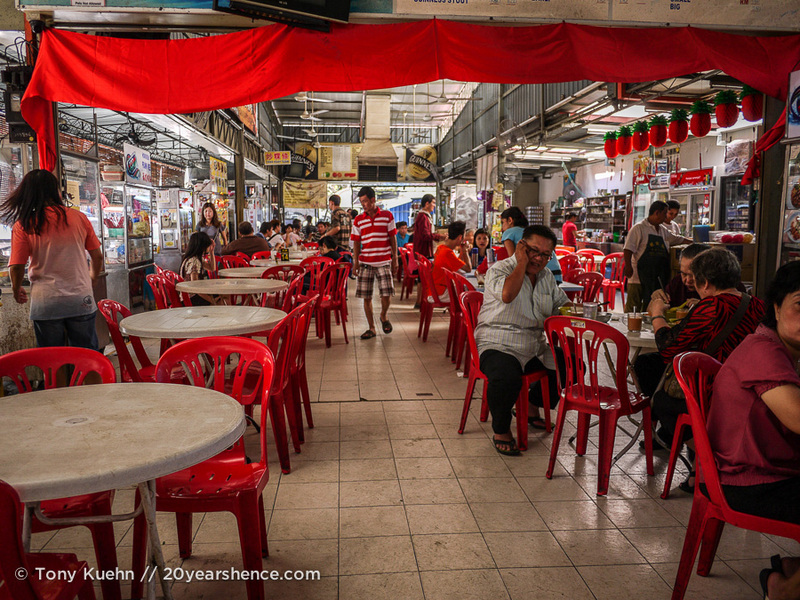 A small-scale hawker center, we were ensnared by the heavenly smells billowing out onto the street as we drove by. Pulling a quick U-Turn, we doubled back to check it out and are so glad we did. Most of the signs for the stalls within were written in Chinese and therefore completely illegible to us, so after scouting out the joint, Tony made the executive decision that we simply needed to follow the crowd and figure out which stall was selling whatever meal came with the “fried things” everyone seemed to be eating. Turns out those fried things were actually the most incredible pieces of fried fish either of us has EVER eaten. It was accompanied by an awesome noodle soup that featured tofu skin, ground pork, slices of liver, chewy ramen noodles, and a light-but-rich broth infused with ginger. Everything about this meal was a complete success! 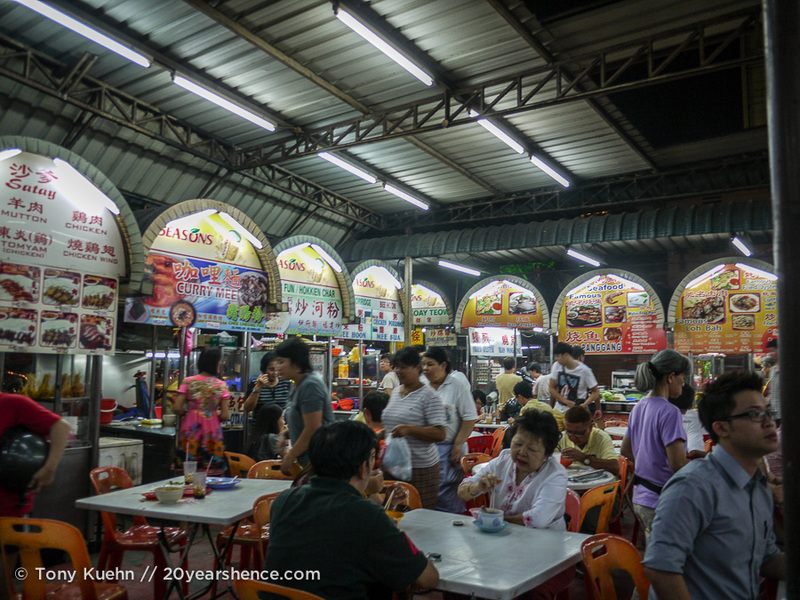 As I mentioned earlier, Malaysia tends to follow the “hawker center” approach to street food, so on another evening we headed off to the Red Garden Food Paradise hawker center… only to promptly leave after a quick browse because of how touristy it felt. Instead we hopped on our bike and drove back to the Yummy Cottage area where we found another random hawker center that looked far more promising and was, unlike Red Garden, brimming with locals. We wandered about for a bit, minds reeling at all the options on offer, when finally a little old Chinese man took charge for us and ordered the food we wanted, which wound up being hor fun (a local noodle specialty, that features a silky brown gravy that is thickened with eggs) for Tony and a claypot chicken rice for me. While we were eating, a torrential downpour began outside, so we spent a few hours here just people watching and soaking in the atmosphere. Also, the food was so good that during our dinnertime discussion we elected to extend our stay in George Town for a few extra days so we could try more dishes! On another motorcycle outing to visit Kek Lok Si Temple (which I’ll cover in our next post), we weaved through the local market at the base of the hill leading up to the temple and found one of our favorite types of restaurants here in Asia: Chinese Buddhist Vegetarian. We love that these places always have a huge assortment of veggie dishes and the price is determined either by weighing your plate OR simply after the proprietress tallies up the number of dishes you’ve sampled. Since it’s all vegetarian and never very expensive, we always load up our plates and try a wide variety of things. This time around, the standout dishes were the curried tofu, sweet & sour eggplant, and a crunchy tofu “sandwich” stuffed with sprouts that we slathered in a tongue-tingling chili sauce. Nirvana on a plate! 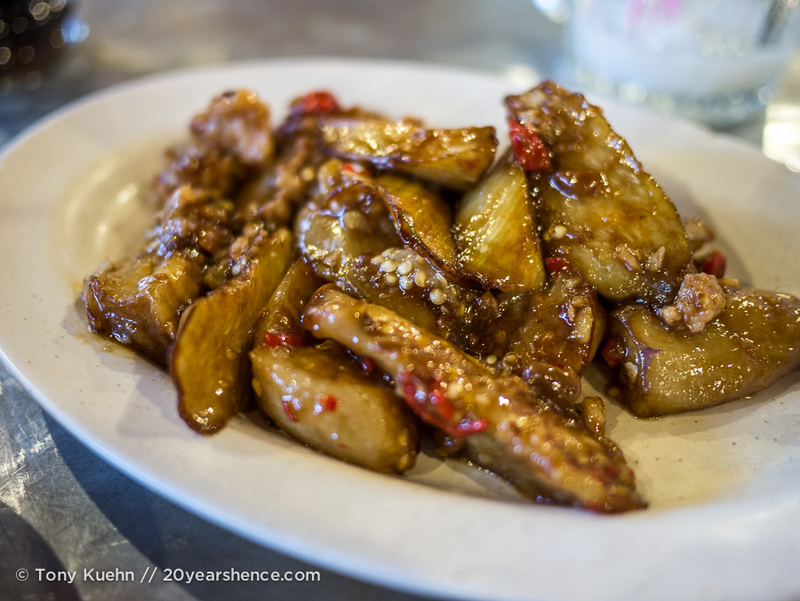 Far and away, however, our favorite Chinese restaurant in George Town was a little place called Tek Sen. Conveniently, Tek Sen is located in the heart of the walking area of George Town, so is easily reached on foot and is guaranteed to be slammed with locals whenever you visit. 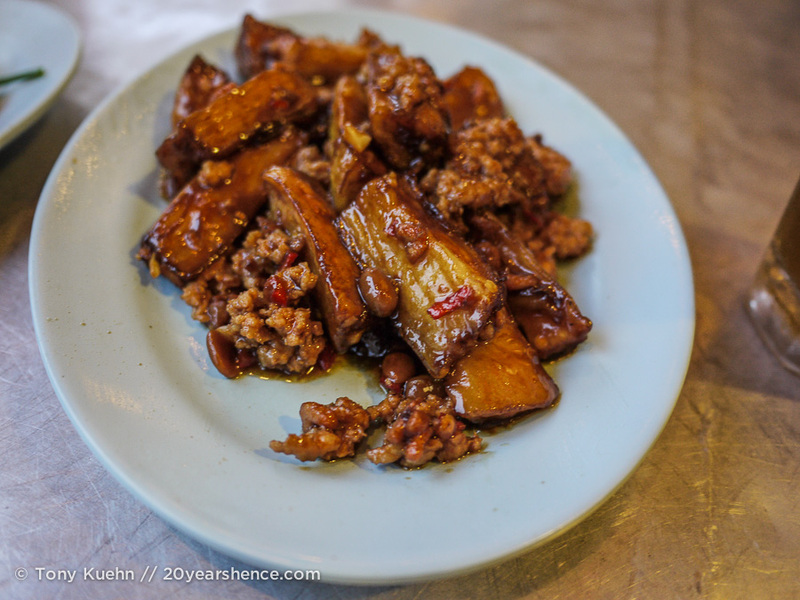 On our first visit, we ordered double roasted pork, eggplant with fermented bean paste, ma po tofu, and a special Chinese New Year chicken dish. Everything we tried was amazing, but that special chicken, which was sweet and juicy and had a real “zing” to it, was definitely the star of the meal. I’ll probably be pilloried for this as I know people from Penang are particularly passionate about the local version of laksa, which differs quite a bit from the version that is more commonly found throughout the country. 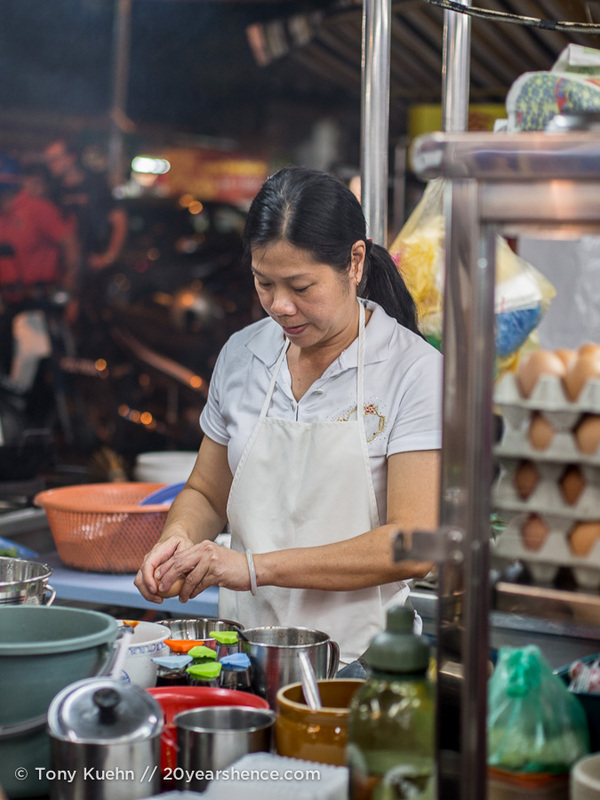 Penang’s laksa, also known as asam laksa, features a lighter, tamarind-based broth that is somewhat reminiscent of a Thai tom yum soup, and fish is the predominant protein. While in George Town, we determined once and for all that we definitely prefer the coconut curry-based baba laksa (known as curry mee, in Penang), with its rich gravy, slow-burn spicy heat, and slight sweetness. We sought out a bowl of penang laksa from a little stall down an alley off of Jalan Penang that is supposedly the source of the city’s best laksa, but I just found the fish flavor completely overwhelming and really noxious. I took one spoonful and that was all I could handle. Sacrilege, I know, but having heard so much about how this was Penang’s defining dish, no one is more disappointed than I! No matter what time of year you visit Malaysia, chances are you’ll be sweating your face off within minutes of stepping out the door. The solution to this is obviously to eat plenty of icy treats to stay hydrated AND ward off heatstroke. 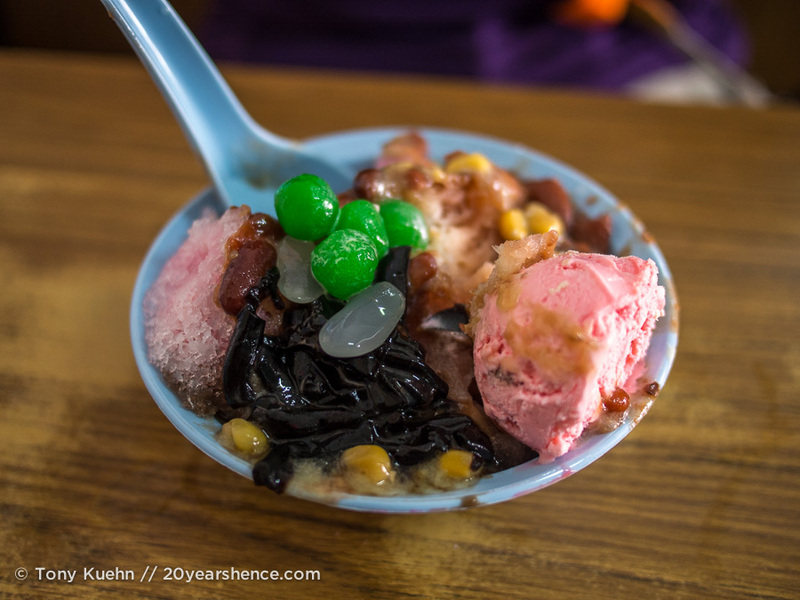 Two of the most popular Malaysian desserts are ais kacang and cendol. Happily enough, located on the same alley as the aforementioned laksa shop are several stalls that dish up these wonderful treats. Ais kacang (also known as ABC or ice kacang) is essentially a Asian cross between a slushie and a sundae: it features shaved ice that is drizzled with rose-infused and sarsi-flavored syrups (sarsi tastes like rootbeer, FYI), and then topped with things like corn, red beans, pandan jelly noodles, and ice cream, though truly the sky’s the limit it seems when it comes to possible toppings. 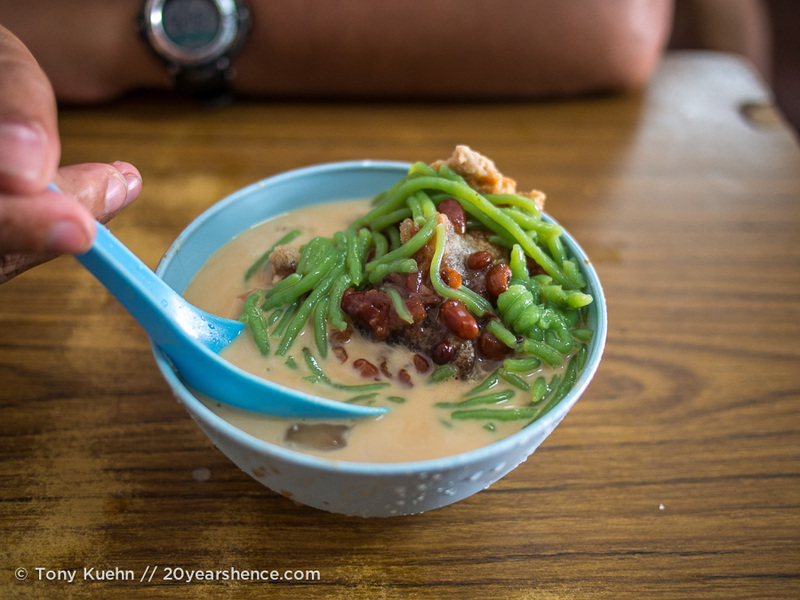 Cendol is a lot simpler, but no less delicious. 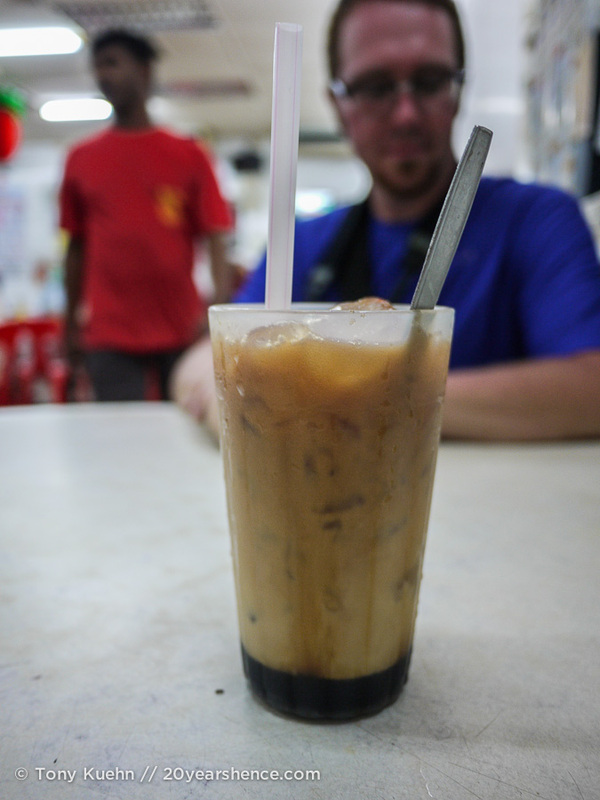 It’s little more than coconut milk, gula melaka (palm sugar), shaved ice, and pandan jellies, but by god is it good! And so refreshing. 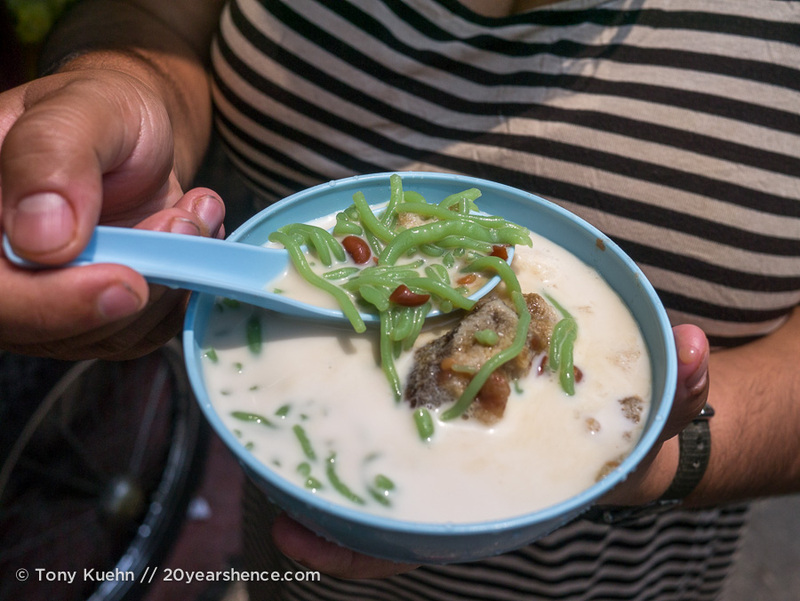 We went back and forth about which dessert we liked best, and after an epic tug-of-war, settled on cendol as our favorite, with the heart-stopping palm sugar syrup mixed with the creamy coconut pushing it over the edge. So, there you have our top meals (and one flop) during our time in George Town. I think we did a pretty good job of sampling the local cuisine, though if there were any gaps, I’d probably have to say that we perhaps should have made more of an effort to uncover the purportedly incredible street food. 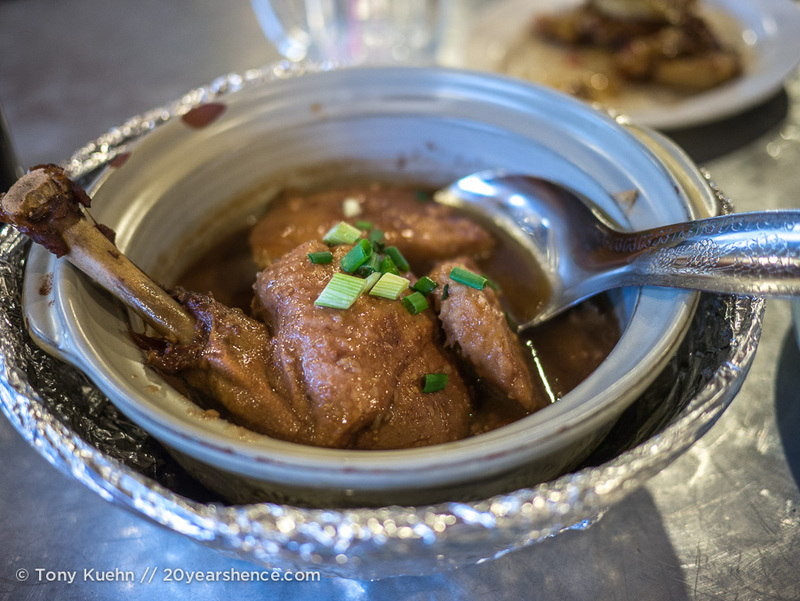 Additionally, Penang is known for its rich Peranakan history and food culture, and we didn’t make sampling that a priority, though I think this is because we had already tried (and loved!) this style of cooking while in Melaka. Nevertheless, we thoroughly enjoyed both of our visits to George Town and the glorious food benders we subsequently engaged in. Even with our ridiculously high standards when it comes to food, the meals we enjoyed here certainly constitute one of our highlights during our time in Malaysia. During our time in Penang, we frequently turned to the website Open Rice for guidance on good places to dine throughout the city. Although we discovered it late in our travels, it appears to be a useful resource for any food traveler in Malaysia. Tell Us: If you’ve been to George Town, what’s your favorite local dish? What did we miss? If you’ve never visited, which of these dishes would you be most curious to try? 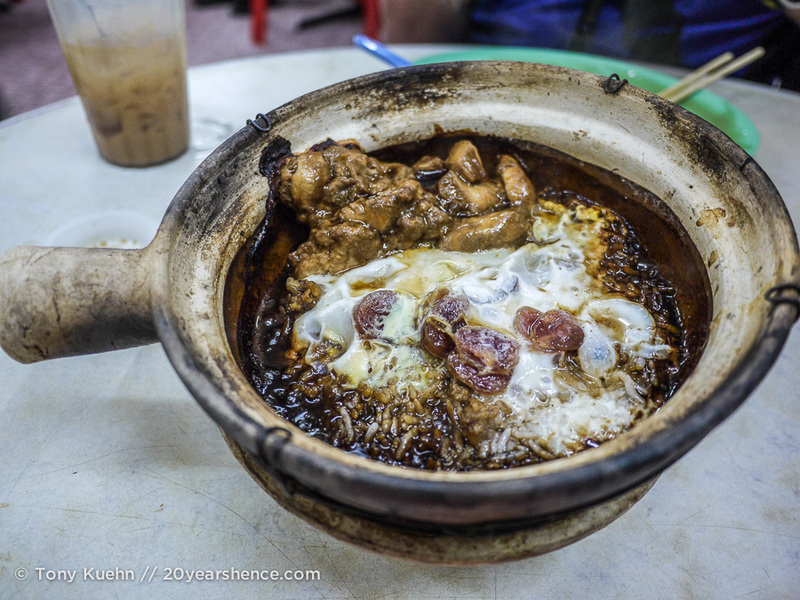 Hmmmm I LOVED Melaka food, but never made it to Georgetown – will need to get there sometime for a culinary tour! Tim | UrbanDuniya recently posted..Why is Bhutan so special? Yes, absolutely! 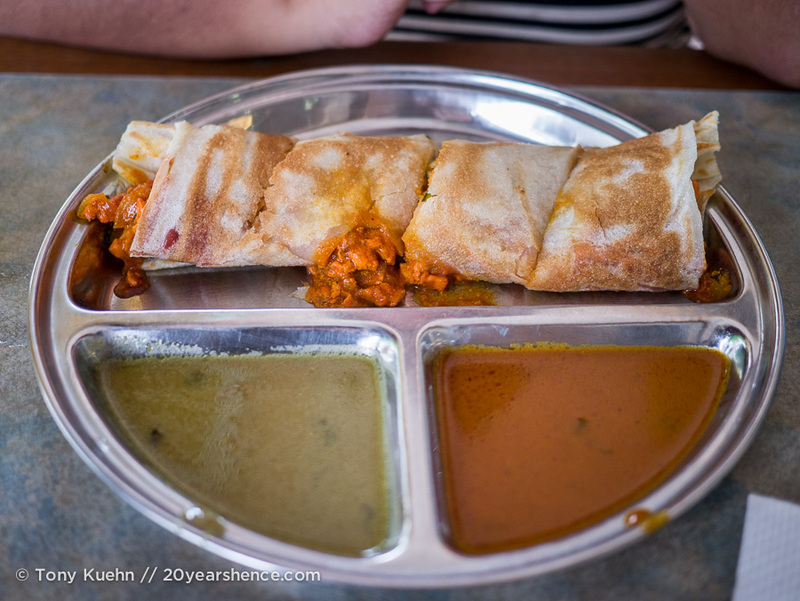 Overall, we did slightly prefer the food we had in Melaka to the food we had in George Town, but it was definitely a case where there really wasn’t a bad choice! The food looks delicious! Great way to explore the city through dining around. Did you find it cheaper to eat out than cook? I know it’s different in Latin America, but in Asia it is rarely more cost-effective to cook for yourself, particularly as a single traveler. I’ll be posting a round-up of our budget in Malaysia soon so you can see for yourself, but it’s really unusual for a meal to cost more than, say $3US per person… Given that, I think in the past 2 years, we’ve cooked maybe 5 times (and pretty much all of those were in CouchSurfing situations). Yep, yep…ditto…everything you said. The Indian food was amazing. 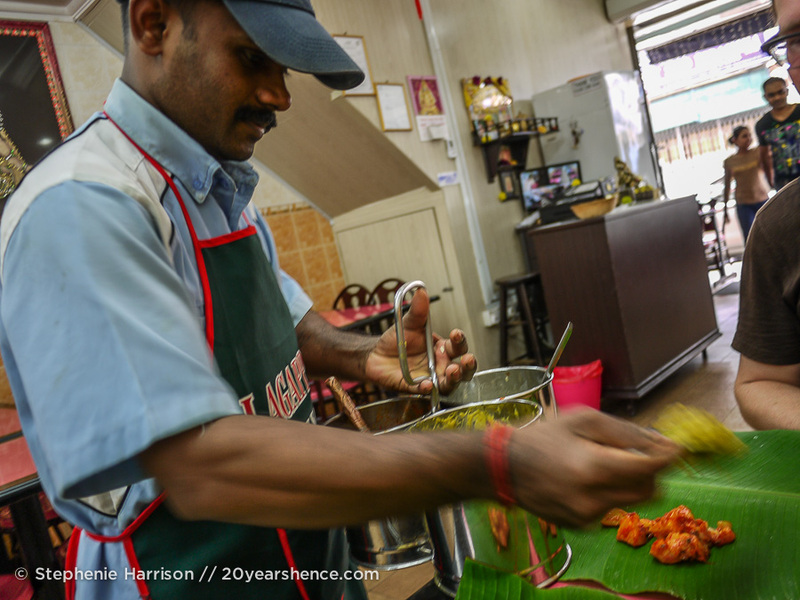 We ate at Jaya several times and also really like the banana leaf dishes at Sri Ananda. We hated Red Garden, could never really find anything interesting to eat there. 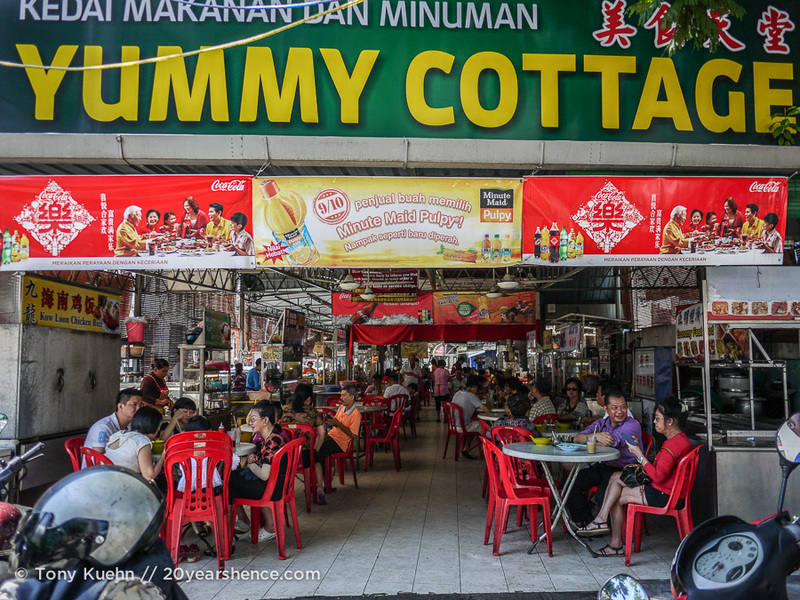 The hawker stalls we loved were in Batu Ferrenghi and we only had a chance to go there once. I was quite disappointed with the Chinese street food. Maybe I was ordering the wrong things but everything was kind of bland. Nothing special. The dim sum we had was just OK. We ate at a great Chinese restaurant a couple of times called Tek Sen.
We did enjoy the asam laksa in Penang, but the best was definitely out of town a bit neat the Kek Lok See temple. But if I had tried Nyonya laksa, the one with the creamy broth, I may have also found the asam kinda meh. Because the Nyonya laksa is out of this world. I think we enjoyed the food more in Melaka too, which we visited after Georgetown, but I’m betting it was just because we are pros at ordering Malaysian food now. Did you guys try cendol in Melaka? A bit different. No soupy coconut milk, but an ice cream like topping. Yummy!!! Sounds like you guys really made the most of your time in George Town! Well done! We kept meaning to make it to dim sum, but then could never get up early enough. Maybe we didn’t miss out on anything, despite our slothful ways. We were certainly happy enough to just eat at Tek Sen! I’m not sure I ever could have handled asam laksa as its done in Penang (I am really sensitive to “fishy” flavors), and I know several people online expressed surprise when we said how much we loved laksa. It sounded like they had tried this version first and it had turned them off the dish forever! Foolishly we did not try cendol in Melaka. Obviously we had no real idea what we were doing there (only our 2nd stop in Malaysia) and just didn’t know which dishes to make a priority. Can’t believe it involves ice cream… Next time! What a great post and amazing photos. Especially love the food ones, makes my mouth water for sure. Thanks, Kadri! Glad you enjoyed it! I just loved this post. Once again, I affirm that you should be a professional food critic. I would actually look forward to reading your descriptions of food in a newspaper. Loved your introduction and the hair analogy haha! And I enjoyed the technique you used in order to track down that fried fish. Thanks for this. It’s after 4 am in India, and I can’t sleep. Now I’m starved. I guess I should have known better. Also, I should add my foodie adventures in India are just beginning. I’m pretty much in heaven. Thank you so much for the support Colleen! I love writing about food, so it’s nice to hear that someone feels like I do a good job of it! Who knows where this might take me one day, but sincerely, thank you for enjoying what I do so much! And I am SO EXCITED to read about your own adventures eating in India! If our time in Malaysia was any indication, you are in for a good time! Okay…so we just rolled into a new town during Carnaval. Today is the day that EVERYTHING is closed, so we had a bland, overpriced meal at the only restaurant we could find. Then I read this post. I am dying for Indian food. Curses. I’m so sorry to hear this. I think there are a lot of things to get excited about in Central America, but based on my reading, it would not seem the food is one of those things. Just reading this post myself, I’m now dying to go back to Malaysia! To be fair to you, the Buddhist veg place that we found was not really in the walking area of town, and there’s no way we would have made it there/found it without a motorcycle. I don’t think you guys made it to Kek Lok Si temple, but that’s where you’ll find a ton of great veggie restaurants. Your food posts are what make me miss Asia the most! 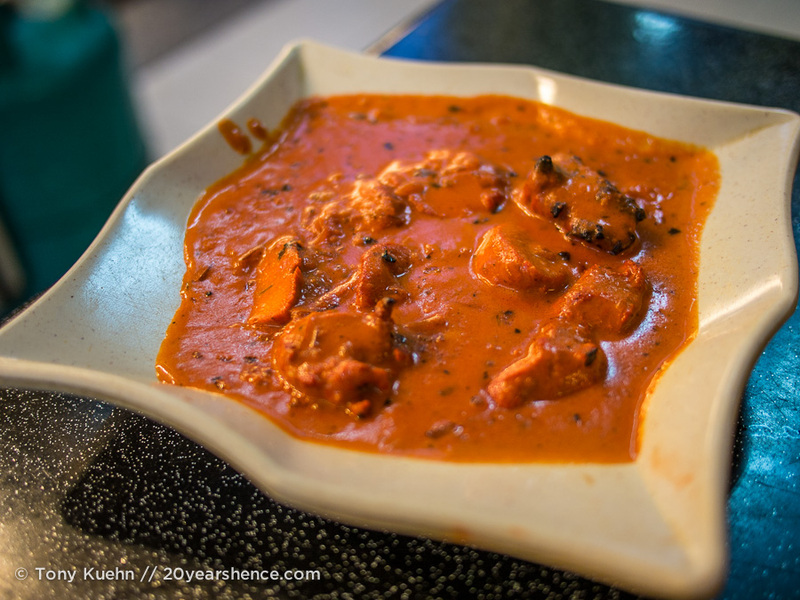 What I wouldn’t give for some delicious, authentic, and cheap Indian food right now! The only thing I’m not sure about is the deserts. I never could get into those.. haha except the shaved ice in Taiwan! I have no doubt that the food will be what I miss the most about Asia, so I don’t fault you there. Then again, you’re in MEXICO so you can’t be too grumpy! Eh, many of the Asian desserts are weird, and I agree that most of the ones we encountered in Taiwan were not our favorite (shaved ice, excepted). These weren’t really anything like the stuff we had in Taiwan, so I think you should give them a shot! Oh my goodness it all looks so tasty! I can’t believe the variety of different dishes you were able to sample and although the curries look AMAZING (I’m starving now) what I’m really going to take away from this post is that slushy/sundae dessert with rootbeer tasting syrup. Yum! Coming from Toronto, Malaysia has been one of the countries where I most feel at home in terms of the food scene simply because there is so much diversity. I love that you can have Malay, Indian, Chinese, and it’s all considered “local”! And all of the flavors are so vibrant and bright. You guys have to go and experience it for yourselves! OMG… not lunch time yet and I am drooling… Indian food is an obsession of mine and must admit, butter chicken sends me right over the edge… looking at the gorgeous picture of the naan and rice and banana leaf and butter chicken and pakoras and…oh my! I too love butter chicken, and this was a perfect rendition of it. Not only was the sauce excellent, but the chicken was really moist and juicy, not dried out as it can sometimes be. I wish I could tuck into a plate of it right now, myself! All that food looks amazing.. I would love to try some. I’ve tried to pick out what I would like to try from the dishes that you listed, but there’s so many! Ha! 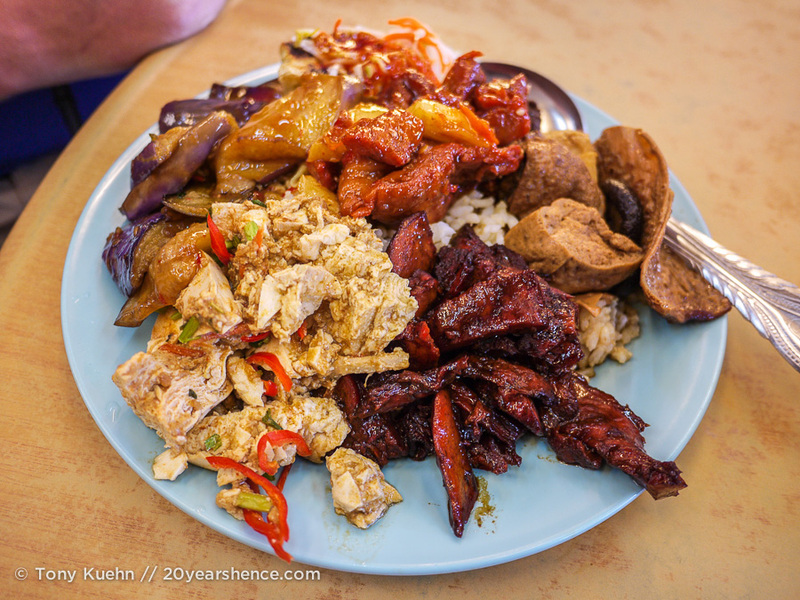 Yeah, there is a lot of choice when it comes to eating in Penang—sometimes it’s actually a bit overwhelming! I suppose the one comfort is knowing that whatever you choose, it’s bound to be good. Thanks! One of the great things about Malaysia is it’s got plenty of foods to delight omnivores and vegetarians alike! Oh how I miss Asian food. There are just not enough Asian restaurants here in South America, only Chinese, but they are not great to be honest. This post literally made my mouth water. I would eat every single dish you have presented here. Sigh! Yum, what delicious-looking photos! I got sick with a respiratory infection the day after I arrived in Malaysia, so I never got to enjoy the food there. Major bummer – your photos make me want to do another trip there! What a shame! There are a few countries where I wouldn’t have been devastated if illness knocked me out of eating the local food, but Malaysia is certainly not one of them. I’d say it’s definitely worth a do-over! I have no doubt that we’ll back to Penang one day, so thank you for the suggestions of where we should make a priority next time! 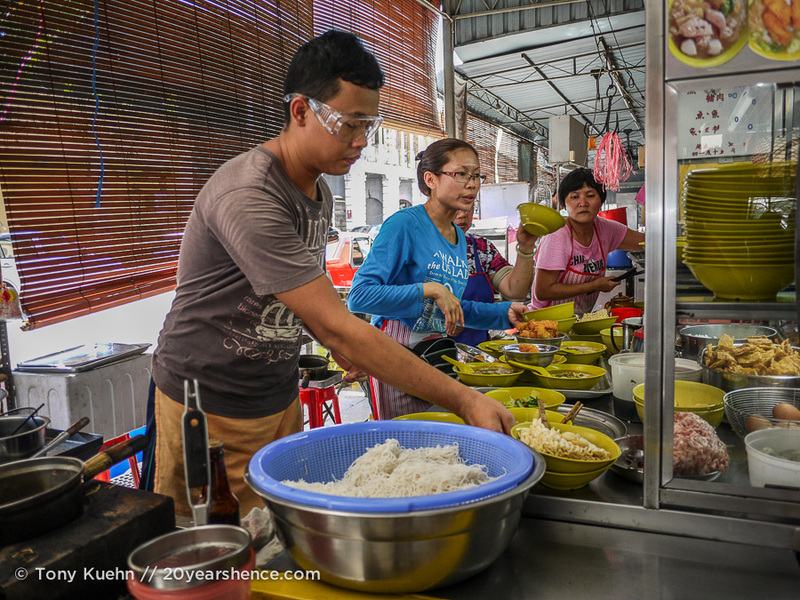 One thing that I’m sure helped us during our time in Melaka that we didn’t get to benefit from in Penang is that we met several locals who guided us towards their favorite food spots… I’m sure that played some role in our preference of Melaka to Penang. I’m not sure if assam laksa will ever be for me though! We also tried it when in Ipoh, and while I liked that version a little more than the one we had in Penang, it still kind of freaked me out! Damn it, am regretting clicking into this post. Salivating. The rule for all readers for these posts is don’t read them when you’re hungry! That goes for me too (though I also have to avoid writing them when I’m hungry…)! We’re currently renting an apartment for a month in Penang so are definitely going to use this post as a guide for when we go on our foodie tour! Can’t wait! Wow! 1 month in Penang! Consider us jealous; you will do some good eating for sure! HI Steph, another fantastic food post! I have an idea how mouth watering the dishes in Penang are. One of my favorite restaurants here in NYC is a Malaysian restaurant call “Nyonya” (they have 3 locations), they are run by family from Penang. One of their relatives, in fact, have a restaurant here called” Penang” but I love Nyonya better. The dishes are divine and I can just imagine how much incredible the dishes are back there in Penang. I hope to go food tripping in Penang sometime soon. Oooh, how lucky that you have so many Malaysian restaurants in NYC! You really don’t see them that often outside of Asia, I find, and that’s such a shame because the food is so good. 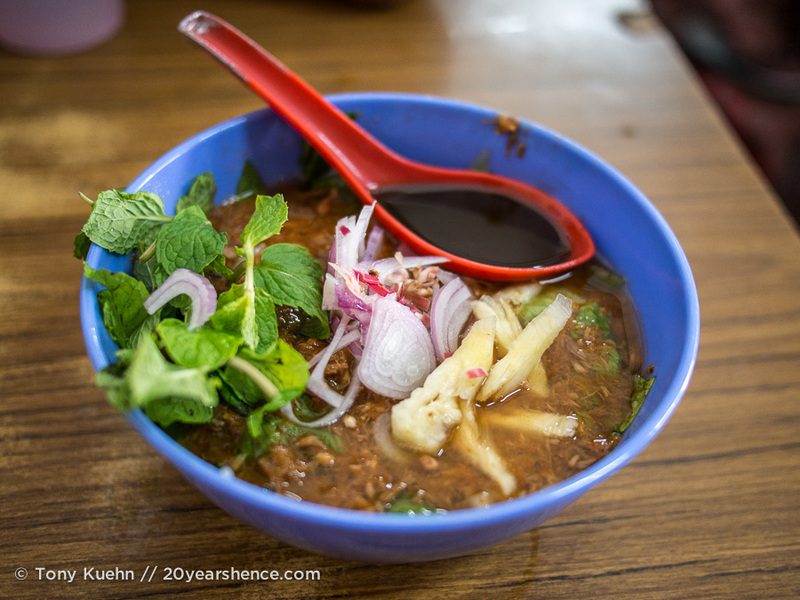 You would love a foodcation to Penang, I’m sure of it! Tek Sen is AMAZING and I highly recommend it to anyone visiting George Town. But yes, Malaysia is a country where you just can’t go wrong when it comes to food wherever you should find yourself. 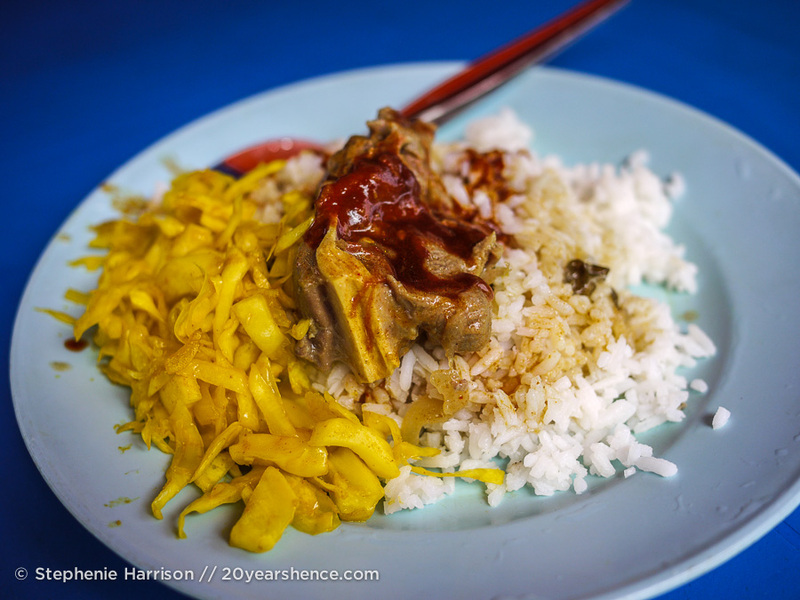 We were only in Penang for a few days, and we’re kind of picky eaters. But we did find some amazingly delicious satay at a couple of stands in the McAlister hawker area, which we just ended up eating 3 nights in a row. We tried some Chinese chicken rice for lunch one day but neither of us liked it. We struggled to find food for lunch since the markets we knew of were only open at night, so I will admit that after the chicken rice incident, we just ate at the nearby Subway for lunch. You can’t go wrong with satay, that’s for sure! Not sure why we didn’t eat any while in George Town… maybe we had just OD’d while in Singapore and other parts of the country? It’s a shame that the chicken rice turned you off of the local food for the rest of your visit. It’s not my favorite either, but I feel like Malaysian food is so diverse that one or two dishes that aren’t my cup of tea shouldn’t prevent me from finding other ones that are. I do understand that a bad eating experience early on can make you gunshy about a place, though! I’m SO glad we’re about to go to Malaysia and I’m not reading this after going. This will help us immensely as we navigate all the options. I CAN’T WAIT TO GO BACK TO ASIA! Yes, foodwise, I think it’s clear that Asia is where it’s at. And Malaysia is really no slouch when it comes to good eats. 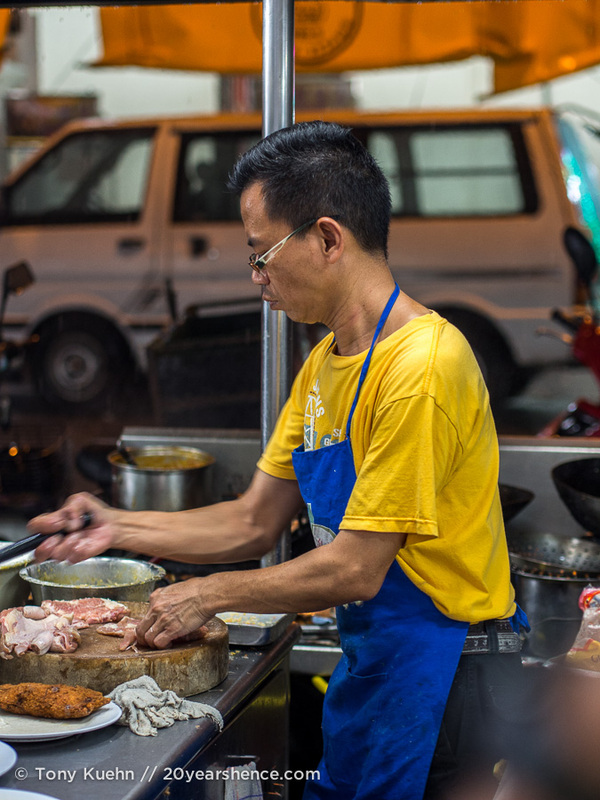 Again, I think it does behoove travelers to do a little bit of research when planning to eat their way through Penang, but it’s also a place where following the golden rule of “go with whatever smells/looks good” won’t steer you wrong. It looks like you enjoyed some delicious meals! I’m happy to see that it doesn’t appear to be too difficult to find vegetarian meals there. We’re both vegan and it seems like we wouldn’t have too much of a problem! Yes, there are actually quite a few Malay dishes that are veggie friendly, and of course, Indian is always a great winner for those who don’t eat meat. I think most of the veggie dishes we ate were vegan too—you don’t really see much dairy being used in any of these cuisines, and we didn’t eat eggs much either. George Town was indeed delicious. I got my introduction to many dishes, some of them unforgettable. Tek Sen was amazing! I did fall in love with laksa there, actually prefer the asam variety to the nyonya one found down in Melaka. Too bad you didn’t find one to like, but if you don’t like fishy tastes, there’s nothing you can do about it (it does sound fishy to me, though). Anyway, I had a great one at the hole-in-the-wall place next to the most popular chendol stand and an amazing one at a stall near the Kek Lok Si Temple in Air Itam. Nothing foolish about not trying some foods. You can always go back and when you do, there’ll be things left to explore! We tried that asam laksa you tried near the famous cendol stand is probably the one we also tried and just couldn’t stomach. 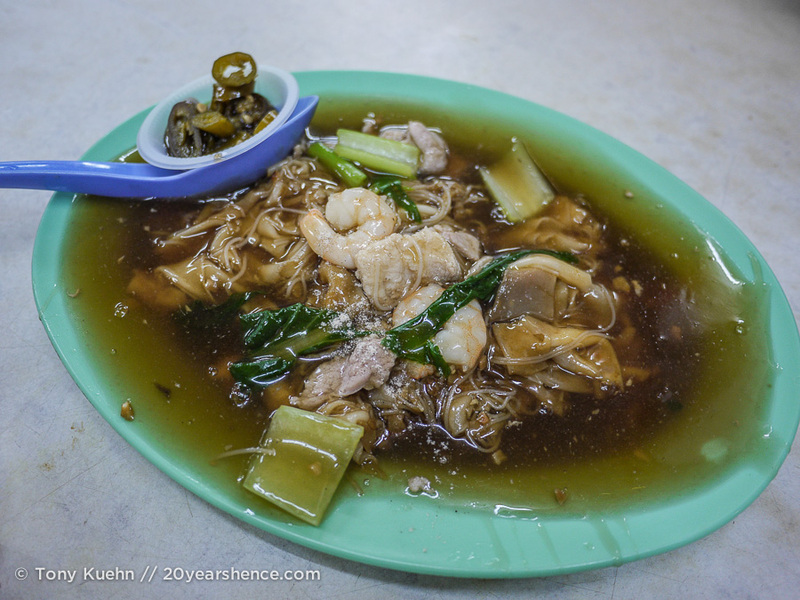 Our “fish tolerance” has improved in leaps and bounds on this trip and even since that visit so maybe we’d handle it better now… still, I don’t think we’ll ever prefer it to the amazing Nyonya Laksa. And yes, we’ll definitely be heading back to Malaysia at some point, I’m sure, and will make eating all the things our top priority again!